Noel is on Spring Break this week, but not really, because he's still going in to school to study and to write briefs and do the things that law students do (proud of him for working so hard! ), BUT I was able to get a massage on Monday while he played with the boys. A big thanks to Kayla for editing these pictures of me. I was having a wonky moment earlier, (which left us laughing so hard), and she was such a great friend to help me. We're finally going to meet this July! Isn't that exciting?! Blog friends finally turned real-life friends! PS. I do love these polka-dot pants. See other ways I've worn them here and here. I love every time you break out those polkadot pants! I love hot stone massages, whenever I'm lucky enough to get a massage I always ask for the hot stones... they melt your muscles like butter. you are so absolutely gorgeous! i love these pictures, Kayla did a great job editing! and I'm sure a massage was so nice! I need a hot stone massage. Actually, my husband and I are taking a trip to Las Vegas this weekend and I may need to visit the spa. And your outfit is so cute but you always look great! You're the sweetest. I'm still laughing about our conversations yesterday!! Seriously I'm also going to need this outfit! Those pants are rocking. I had way too much fun editing these for you. Love you!! Seriously, is it July yet?!! Um, first of all, you and Kayla meeting is SO exciting! Second of all, my body is screaming at me right now wonderful why I've never given it a hot stone massage. Sounds won. der. ful. These polka dot pants are just the cutest on you! I must find a similar pair for Spring! YAY for a hot stone massage! I'm totally needing a little pampering right now and am totally jealous! You look absolutely fabulous - this whole outfit is so simple and chic. 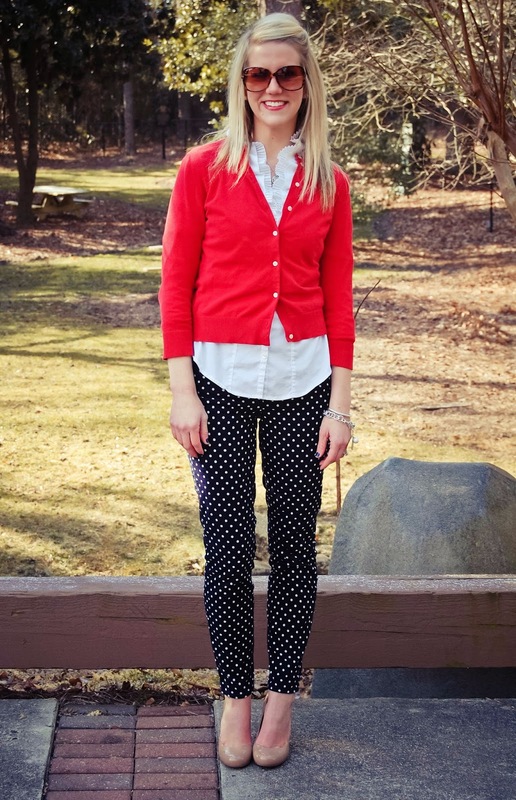 Love, love, love your polka dot pants paired with red! I bet that massage was so relaxing! I love everything about this outfit! Perfectly styled. A hot stone massage sounds wonderful about now! Gorgeous! Love your hair! oooh, the massage sounds so nice right now!! Ahh massages are the best :):) And I LOVE printed pants--you look fabulous :) I am a new follower coming over from Random Wednesday--can't wait to see more of your style! I love black and white mixed with red! It's one of my favorite color combinations. 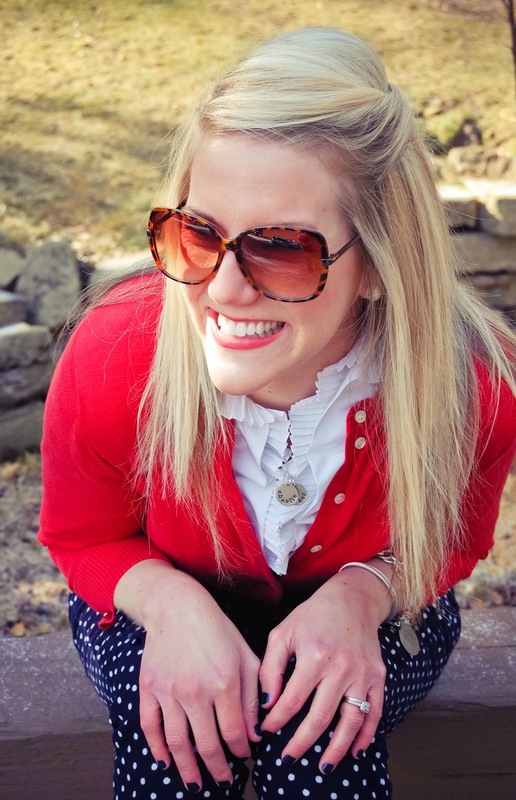 The touch of the polka dots makes this outfit even more whimsical and fun! :) You look great! I'm loving the dotted pants! I was totally supposed to get a hot stone massage on Monday at Flawless Day Spa in Chapel Hill, but my husband didn't want me to go out in the "storm" haha! Glad to know they come highly recommended! You and Kayla melt my heart! She did a fab job with the editing!! Blog buds are the best!!! I haven't gotten a hot stone massage before but it sounds heavenly....this momma needs one stat! :) You are PRECIOUS!!!! A massage would be the perfect way to start the week. I love your sunglasses, where are they from?? Aaaaaand I'm pinning this look because it's perfection. Thank you, once again, for the inspiration. Oh, and heck yes to a massage every Monday. If we instituted massage Mondays, then maybe no one would have a "case of the Mondays." Right? The combination is so nautical. I love it. I agree about the hot stone massage. I got a massage gift certificate for V-day and I am SO READY to use it. i love that blouse! and those pants too! and i know you said you're considering cutting your hair on my post last week but you seriously have gorgous hair and i want it!!! You've really been nailing it with the fashion posts lately! One adorable outfit after another!! And the massage sounds IN.CRED.I.BLE. So glad you guys are going to meet!! Blog friendships are the BEST. This is one of your best outfits, so adorable and chic. I pretty much own identical pieces so I will copy this from you if you don't mind LOL.